Lehendakari Iñigo Urkullu, the Basque Premier, met with the President of Chile, Sebastián Piñera, at La Moneda Palace. 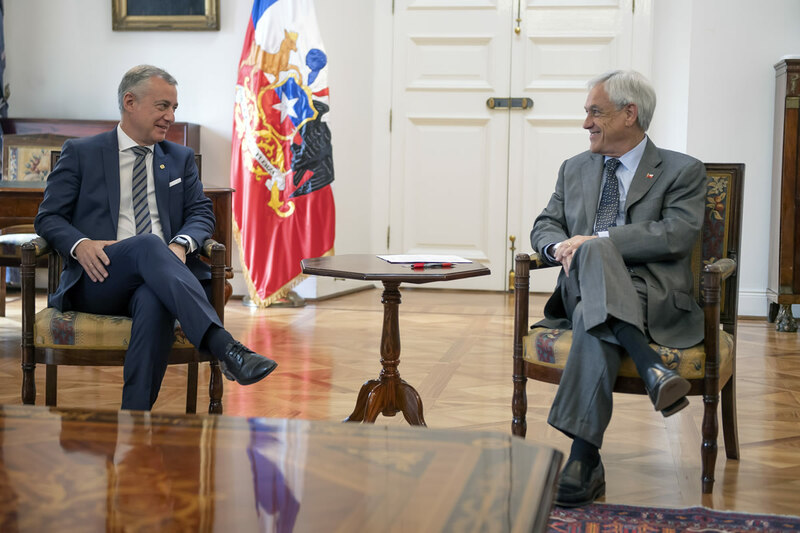 During the meeting with President Piñera, the Lehendakari thanked him for how Chile had welcomed and treated the people who had fled from the Basque Country during the Spanish Civil War and the time of exile. They spent the time discussing the relationship between both governments in areas such as industry, education, agriculture, equality, cooperation and governance, and promised to continue to build closer ties. The Lehendakari stressed that the relationship between the Basque Country and Chile dated back to the 1990s in the areas of education, agriculture, equality and development cooperation. They also reflected on good governance and transparency. The Lehendakari stressed that Chile is an “open, robust and viable” country for Basque business and commercial interests. As an example of the interest in the country, the Lehendakari explained that 200 Basque companies had visited Chile in the last 3 years to learn about its economic situation. This meeting was a "magnificent opportunity”, in the words of the Lehendakari, to step up relations between the Basque Country and Chile. Thus, the Lehendakari has invited the Chilean President to visit the Basque Country next year on the occasion of the celebration in the Basque Country and Chile of the 5th Centenary of the expedition of Elcano and Magellan. In addition to the Lehendakari, the General Secretary for External Action, Marian Elorza, the Basque Country Delegate to Chile, Rafa Kutz, the Director for External Relations, Leyre Madariaga, and Ambassador Enrique Ojeda were present at the meeting with President Piñera, which lasted three quarters of an hour. In the early morning, the Lehendakari chaired the regular meeting of his Cabinet by means of a videoconference. Subsequently, the Basque delegation held a working breakfast with representatives of the Christian Democratic Party, led by Fuad Chahín. The Basque Government delegation led by the Lehendakari began the official schedule on 31 October. The institutional visit began in Buenos Aires where the Lehendakari met with the President of Argentina, Mauricio Macri, with the Speakers of the Senate and the Lower House, and where he visited the Sitio de la Memoria [Remembrance Site], the former detention and torture centre under the Argentine Dictatorshiop. The delegation then travelled to Mar del Plata to take part in the Basque National Week. The schedule ends today in Santiago de Chile with a meeting with President Piñera and where a memorandum of understanding with the Ministry for Women and Equality. During this last week, the Lehendakari has been accompanied by the General Secretary for External Action, Marian Elorza, the Director for External Relations, Leyre Madariaga, the Director for the Basque Community Abroad, Gorka Álvarez, and the Delegates of the Basque Country in Argentina-Mercosur and Chile, Sara Pagola and Rafa Kutz, respectively.